Life is in constant motion and I am pleased to announce my latest project, Online Boutiques by T Marie. I have personally hand picked the most stunning and fashionable designs to bring forth to you boutique style. Go to www.OnlineBoutiques.US and enjoy an intimate shopping experience and please don’t worry I am working hard pounding my fingers to the key’s finishing up my next novel. When I’m bad, I’m so bad and when I am good, what can I say? I guess I’m still a little wicked. I do realize that I have left you wandering out in the mist of blogger land and I greatly appreciate you staying with me. After my extreme stunt of jumping out of a plane at 13,000 feet to fall roughly 120 mph with a giant of a man strapped to my back, I can only begin to tell you that i was beyond grateful that my parachute opened without a single glitch. The very next day, my husband and I loaded up our car and headed to our cabin. It was there, nestled amongst the mountains ,where I spent the entire summer cooperating and swearing to never let my children talk me into anything like that again. So after such a huge response and unbecoming begging from all of you, I am back and do solomnly swear, I will whole hartly strive to keep up on all my blogs! Well once again summer has fallen upon us and the sweet southern air has been bogged down with moisture, while the sun’s unmerciful rays sizzle down baking us all. “One can only stay in their pool for so long.” My husband yells at me. Learning well from our children, I choose to ignore his statement. I close my eyes, lay my head back and let the coolness of the water do it’s duty. I have only a few days left to contend with the heat, as we will be loading up our mountain dog and our hemingway cat. The car will be packed full and we will be happily heading for the Mountains, where the air is cool, elevating our senses and thus providing us with a renewed sense of energy. I call this little piece of heaven our spa and believe me when I say It’s well needed. 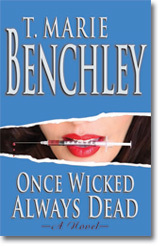 Life has been in overdrive and we have been rearing up the engines for my release of “Once Wicked Always Dead” The response has been overwhelming and the huge demand for my Galleys have left me with only empty boxes at the warehouse. On a good note; due to the positive respond that we have had with all of the book sellers, we will be increasing the first printing by thousands. So with that being said I will be on my way, but before I go I must tell you about the little promise that I made to our children when I was at a weak moment. ( I swear they have a sixth sense in knowing the perfect time when to hit me up for what they desire.) This has been something that they have always wanted to do with me for a long time and with their constant begging, I had no choice but to give in. What might this request be? Well all I can say for now, is that it has something to do with me jumping out………..Well maybe it will be better if I just wait and tell you after I do it. Ready to sign but where are my Galley’s? I would like to tell you all a little story about an Author (who would happen to be me ) and was invited to sign her Galley’s ( Which happened to be of Once Wicked Always Dead) at one of the largest book shows in the world and had the worst misshap or should I say nightmare imaginable. So all in all, what could have been the worst tragedy for any author turned out to be a huge success. Lesson in life, like the old wise man said, ” When life throws you lemons, make lemonade” and after sending out all those books I think a nice cold glass of Lemonade, smelling the Jasmine and sitting out by our pool is exactly what I am going to do.